I want to add a can of 100% pumpkin to my favorite bran/ww flour/oatmeal muffin recipe and think I may need to add a bit more dry ingredients. 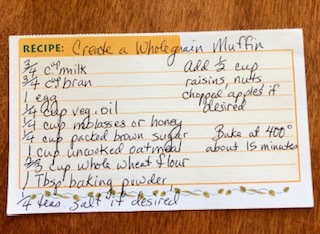 Picture of recipe card is below - hopefully. This is just my second posting at this site. I will greatly appreciate any advice on amending the recipe. Browse other questions tagged substitutions muffins pumpkin or ask your own question. Can I freeze muffin mixture? How important are eggs for a muffin recipe? How can I convert a muffin recipe to make crumpets?